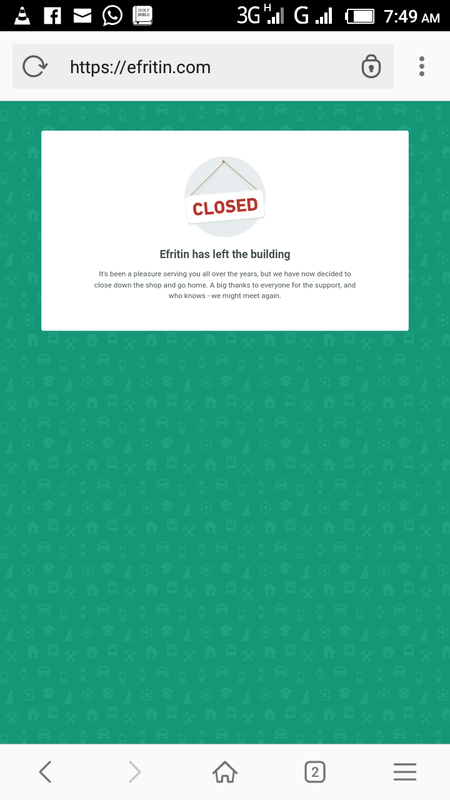 I don't know how true this is, but according to news reports this week, online classifieds marketplace, Efritin.com has closed shop in Nigeria due to Nigeria’s economic conditions and high cost of data, 16 months after its launch. “It basically has to do with the fact that we didn’t get desired returns on our investment, so we decided to scale back on our investments in Nigeria and that means we are forced to let many people leave the company,” Nils Hammar CEO of Saltside, owners of Efritin told ITWeb Africa in an interview. The staff of the company are already leaving the head office, which is located in Ikeja and the properties of the company are being put up for sale. However, the company clarified that the site is not going to be shutdown but it will be up and running as it has been. But how do they intend to manage this? “I think the data cost in Nigeria is very high. In comparison to other parts of West Africa, Africa and the rest of the world, it is very expensive to use the Internet for the vast majority of the people. It is very difficult for e-commerce and classifieds because they are quite late in the evolution of the Internet industry,” said Nils. Why Efritin.com may not have closed shop because of Nigeria’s economic condition. It would be recalled that in November 2016, it was reported that the former marketing manager of Efritin.com, Uche Ajene who is well known in the online retail space had accused the Somalian national and former MD of Efritin.com, Zakaria Hersi of stealing thousands of dollars, turning a blind eye to internal mismanagement and false fully creating invoice trails. According to Techmoran, senior members of Efritin.com management who pleaded anonymity say that Zakaria Hersi’s activities were the beginning of the end for Efritin.com Nigeria as they struggled to raise further investment to scale the business. The company is also reported to have 10 court cases in Nigeria that would cost it about N20million in fees. Although in an interview with ITWeb Africa, Nils Hammar CEO of Saltside, owners of Efritin refused to comment on the court cases and said it was not the reason why they were closing shop in Nigeria. “I’m not commenting on any legal issues whether it’s true or its status. I understand the question from your point of view, but I cannot comment on it,” said Nils. Looking at the issues that faced the company one will wonder if the high cost of data or Nigeria’s economic condition is the real reason why they are closing shop in Nigeria. If Efritin.com can close shop due to high cost of data and economic conditions with all their wonderful teams and management, I wonder what will befall other entrepreneurs and online vendors are springing up everyday in Nigeria.